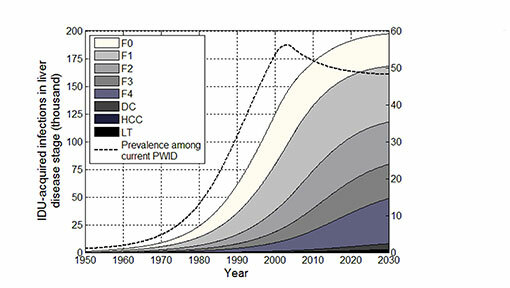 An 80 percent reduction in HCV incidence by the year 2030. 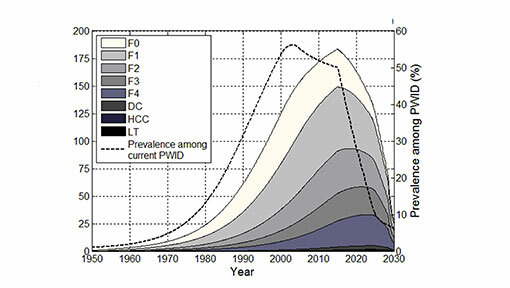 Image: HCV related liver disease among current and former PWID in Australia: project outcomes 2015-2030 under different treatment scenarios. How do we determine the most cost-effective scale-up of treatments among priority groups, through different modalities, and over different time-frames? How much will it cost to reach strategic targets? How can the cascade of care be optimised to maximise the number of people receiving curative treatment? Which modalities of which programs are required (e.g. mobile clinics or nurse-led models of care)? Get as close as possible to multiple national targets. Limited provision of diagnostic services to Victorians living with hepatitis C antibodies, 2001-2012: a multi-level modelling analysis.